The Olympic Games in London have sparked interest from fraudsters, with a raft of sites supposedly offering live video streams of events, according to security vendor Trend Micro. Trend Micro called out on Sunday more than a dozen sites that it marked as questionable, with some sites having a dual-edge scam by purporting to offer tickets as well. One of the websites offered online viewing packages for US$29.95 and $49.95, payable with credit cards and PayPal. The International Olympic Committee (IOC) grants rights to broadcasters for game coverages. For this Olympics, the IOC has granted rights to 33 organizations worldwide, which will broadcast in 200 countries, according to data published by the organization. (See also Tech Hive's Viewing Options for the Olympics). Outside of major broadcasting organizations, chances are websites offering streaming coverage probably are not legitimate. Trend Micro pointed out that the fake websites may also be using the ruse to harvest user data. 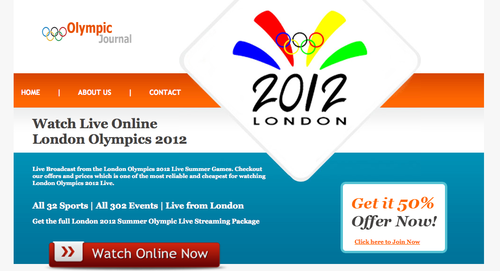 Fraudsters tempt Olympic fans with bogus streaming websites. "Other fake live streaming sites when clicked will redirect to another site requiring an email address," wrote Maela Angeles, a fraud analyst with Trend Micro. "As such, cybercriminals can harvest email addresses, which may be used for their spamming activities." Another security company, Zscaler, wrote on Saturday of an uptick in the number of fake sites offering Olympic tickets. "Currently, the volume of websites selling bogus Olympic tickets are on the rise," wrote Krishnan Subramanian of Zscaler. "These sites normally propagate their campaigns though unsolicited ad banners, popups, social networking sites and email messages." Subramanian wrote that one of websites examined sent data such as credit card information in clear text, a major security problem. Other sites examined were pay-to-click scams, a form of online advertising fraud.